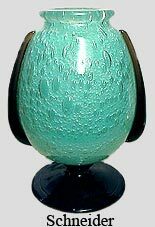 I feel it necessary to give free lessons to all Daum Nancy French cameo glass and Galle glass bidders on eBay who are novices. Please note the distinction between "Galle vase" and "vase signed Galle" or "Galle signed cameo". In the first example, the seller is certifying that the vase is genuine Gallé from the turn of the century. In the second example, the seller is merely stating that he is selling a vase and it happens to be signed "Gallé". Most of the time this is an admission by the seller that he is unsure of the authenticity of the vase and most probably the vase is new. New Gallé vases are being made today in Romania and China. They are decent quality, but nothing like the real Gallé vases. They certainly are not worth the price that many novice bidders are paying. There are even a few reproduction vases being sold that are being called Gallé vases. This may be due to a lack of knowledge or a lack of integrity on the part of the seller. Please do not ask me to vet specific items being sold on eBay. I will not make specific comments about any vase being sold other than my own. This is a public service lesson only meant to protect innocent bidders from sellers who want to prey on them. Gallé banjo vases always have a flare at the mouth. If you find one without the flare, it had a chip and has been ground off. Learn your real Gallé shapes (from books, dealers, shows, catalogs, etc). This gives you an edge two ways. First you can tell if a real Gallé vase has been cut down because of chips or more serious damage. Second, for the most part, the new vases from Romania have different shapes than real Gallé. Wrong shape and it can't be a real Gallé! As of now, no one is reproducing early Gallé vases. However, similar glass was being produced at the same time as Gallé. Authentic early Gallé vases need to be signed. Vases with the letters "TIP" are new. TIP in Romanian means "type". 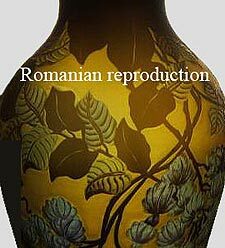 In other words, the Romanian makers are letting you know that the vases are not genuine Gallé, but rather Gallé-type. Be careful though. It's easy for a glass restorer to grind off the letters "TIP". Original Gallé vases are blown while attached to a pontil. The pontil was broken off from the bottom and polished. Then the top rim was finished. Usually, but not always, the rim is rounded and shows original grind marks. Reproduction vases are blown from the other end. They are cut off straight at the top. They do not have polished pontils. The artwork in reproduction vases is frequently inferior to the artwork in authentic vases. For instance the veining in leaves appears a bit cartoonish rather than realistic. At left is an example of the leaves in a reproduction vase. The value of an original Gallé depends on several factors - subject matter, size, color, shape, technique, quality, and condition. Quality in Gallé was inconsistent. Look for those vases that have pleasing shapes, decorations and colors. If you like it, someone else will like it also. Those are the ones you should buy. No two Gallé vases are ever identical. Gallé liked to repeat shapes and decorations. Since each vase is hand-done there will always be some differences as to exact decoration, color, or shape. Think of a painter painting the same subject. No two will ever be identical. The detail in a real Gallé vase depends on the number of acid cuttings. Each successive cutting adds another layer of detail. Therefore the greater the number of cuttings, the finer the detail. 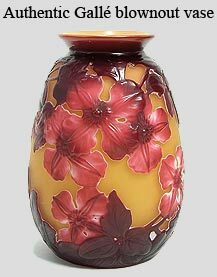 Before a vase is acid cut, it is built up with one colored layer on top of another. The more layers, the more colors. Vases are referred to as 2-color or 3-color, etc. Counting colors is another matter. If the background is frosted, is that one of the colors? Don't be too concerned about the number. If a vase is pretty and colorful, it's desirable. Are vivid colors more desirable than pastel colors? Probably, but not necessarily. Many vases that aren't vividly colored are very pretty. Pretty is more important than vivid. How important is size? As a general rule, the larger the vase, the more valuable. There are exceptions. Miniature vases are very desirable because they're rare and many people collect only miniatures. Huge vases may be difficult to display and therefore fewer collectors may have interest. I want to start collecting French cameo glass but don't know where to begin. Rule #1 - Buy from a reputable dealer. There's an old axiom "If you don't know your art, know your dealer". Rule #2 - Buy what you like. If you can afford more expensive vases, and you're brave, start there. Otherwise, do as most people do. Work your way up. You're going to put your collection in a cabinet or on a shelf and look at it every time you pass. If you buy what you like, you'll be pleased every time. Learn your real Gallé colors (from books, dealers, shows, catalogs, etc). This is harder than it sounds. The new Gallé colors are only slightly different from the real ones. After you've seen enough real vases, you can tell a fake immediately just from the color. How important is the investment value of a French cameo vase? That depends on you. I always advise people to buy what they like. Other people will probably like the same things you do and most likely those will be the best investments. Investment should be a secondary consideration at best. Is Daum Nancy glass being reproduced? Yes. Daum vases are now being reproduced. Daum glass falls into two main categories - acid-etched or both acid-etched and enamel painted. Both types are being reproduced. The quality of these reproductions is not up to Daum quality, but good enough to fool many people. It's important to know Daum shapes, colors, subject matter and quality. The reproductions are not exact copies. The shapes and subject matter are slightly different than the originals. The color is not as rich and the quality is inferior, but getting progressively better. They're more difficult to spot than the Romanian Gallé reproductions. The new signatures are a little crude, especially the Cross of Lorraine. Professional consultation is advisable. Should I buy Gallé or Daum Nancy? This is a personal taste question. Should I eat apples or pears? It's the same answer. Buy what you like. Gallé and Daum were the finest makers of French cameo glass. Some collectors prefer one over the other and many collectors collect both, as well as some of the lesser known makers. 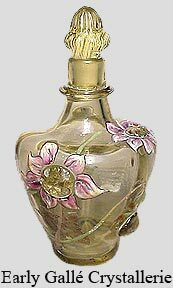 What are some of the other high quality makers of Art Nouveau French cameo glass? Muller, D'Argental, and deVez. Legras, Richard, Arsall and others would follow those in quality. This is only a partial list. Should I consider buying some of the lesser known names in French cameo glass? Absolutely! Muller is almost on a par with Gallé and Daum. D'Argental and deVez made consistently high quality vases, but are not well known. Legras was inconsistent. Some Legras vases are very nice quality while others are not. Richard and Arsall are down the list in quality. What is pâte-de-verre? Literally translated it is "glass paste". This technique of producing French glass first involved grinding different colored glasses into powders. The powdered glass was mixed with a carrier and used to fill a mold, which was then fired in a kiln to form a solid. G. Argy-Rousseau was the most famous practitioner of this technique. His factory produced many vases, boxes, sculptures, etc. His works are rare, beautiful, and moderately to expensively priced. Almeric Walter is probably second best known. His wares were mostly open vessels with animals such as lizards, fish, etc. These are also quite desirable. Another important name is Francois Décorchemont, among others. 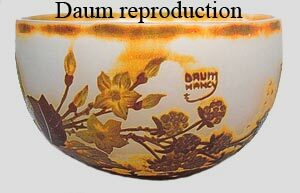 Even Daum produced some pâte-de-verre wares. Watch your pronunciation. It is pronounced paht de ver , NOT pahtay de ver. Is Daum or Gallé still in business? Gallé is not, but Daum is. Today's Daum glass is totally different from the glass of a hundred years ago. Much of it is clear, similar to modern Steuben glass. Daum is still producing some pâte-de-verre today. The quality of today's pâte-de-verre glass is not as fine as turn-of-the-century pâte-de-verre glass but still nice. Air bubbles seemed to have been less of a problem with antique pâte-de-verre. What is the difference between Art Nouveau glass and Art Deco glass? The Art Nouveau period began in the 1890's and lasted through the 1910's. It is characterized by themes from nature - flowers, trees, insects, the sea, etc. The workmanship is realistic and expressed best with curved flowing lines and asymmetric designs. The Art Deco period began in earnest in the 1920's and lasted through the 1930's. Art Deco designs are characterized by stylized floral and geometric designs. They are usually symmetrical. 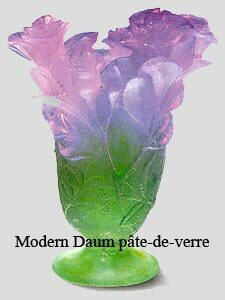 Le Verre Francais, Schneider and Daum were the best makers of Art Deco French cameo glass. There were some decent secondary makers too, such as Degué (pronounced de gay'). 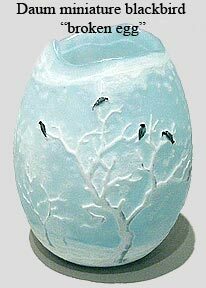 René Lalique produced some of the finest art glass of the period, but his glass is not cameo glass. He produced his wares from molds. What is the meaning of the name "Charder" found in cameo on some Le Verre Francais vases? Charder is a contraction of the name Charles Schneider. It is found only on some Le Verre Francais vases. Some collectors value these items more highly. Many fine Le Verre Francais objects are not signed "Charder". Le Verre Français glass and Schneider glass were both lines of glassware made by the same company. Le Verre Français glass was acid etched most of the time, just as Gallé and Daum did their work. Schneider glass was rarely acid etched. Most of the glass was brightly colored with internal mottling. Sometimes handles or rings were applied. On the best pieces, the applications were wheel-carved. Damaged vases or objects are worth buying at the right price. Buying damaged French cameo glass is a good way to obtain fine or rare examples at a reasonable price. Sometimes an otherwise unaffordable vase can become affordable if it is damaged. Turn the damaged side to the back and show off the good side. As a guideline, damaged glassware should be priced at 1/10 to 1/2 the value of perfect vases. The higher the quality, the rarer the vase, and the lesser the damage, the higher the percentage. Remember a small chip is minimal damage whereas a crack of any size is much more serious. If a crack is only in one layer of glass and does not come through, it is not as bad as a crack that goes through. Some vases are more sophisticated (and valuable) than others. Acid-cutting was the main technique used to produce French cameo glass. 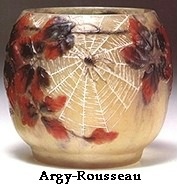 Additional techniques such as gilding, enameling, padding, wheel-carving, applications, mold-blowing, internal decoration, foil inclusions, and marquetry add to the level of difficulty of producing a vase. Each of these techniques takes additional time and skill. They were done only by the most talented glass artists. Certain subjects are more desirable and valuable than others. In Daum, for instance, violets are one of the most desirable flowers. Rain scenes, blackbirds, and Prairie vases, to name a few, are also quite rare and sought after. In Gallé, roses, magnolias and blue scenics are a few examples of highly sought after pieces. In Le Verre Français, animals, trees, and geometric decorations are most collectible. Emile Gallé died in September, 1904 at the age of 58. From 1905 to 1914, a star was put in front of the Gallé signature. Production was stopped during World War I and resumed after the war. The star was not used on vases produced after the war. Most collectors and dealers assume that all vases produced after Gallé's death had a star. This is not true. 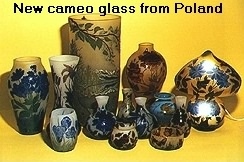 New cameo glass is now being made in Poland, as well as Romania and China. It is my understanding that these pieces are not being signed "Gallé" or "Daum" by the makers, but it is possible for signatures to be added at a later date by unscrupulous individuals.